Michael Wilchesky is an associate with the firm specializing in civil litigation. His practice focuses on civil sexual and institutional abuse and misconduct claims and Indigenous rights. Since joining the firm, Michael has enjoyed working in a broad range of practice areas, including civil sexual assault litigation, Indigenous rights, securities litigation, commercial law, bankruptcy law and estates litigation. In those capacities, he has had the privilege of representing clients at motions, trials and appeals at the Ontario Superior Court of Justice, the Divisional Court, the Ontario Court of Appeal and the Small Claims Court. Michael's civil sexual assault practice focuses on obtaining meaningful compensation for survivors of sexual abuse and sexualized misconduct in complex institutional cases. He has also represented clients in their Criminal Injuries Compensation Board Applications, as well as survivors of abuse perpetrated at Indian Residential Schools, through the Independent Assessment Process ("IAP"). Michael currently volunteers with the Independent Legal Advice Pilot Program for Survivors of Sexual Assault, providing legal advice to survivors of sexual assault to help them make informed decisions about their next steps. In 2012, Michael acted as second chair in a year-long Indigenous and historical flooding trial, which featured the calling of elders, other members of the First Nation community and experts, and was conducted as an electronic (paperless) fashion. He co-authored an article, published in The Litigator (June, 2013), entitled "E-Trials by fire: GAME ON! ", which described the experience. Michael was also published in the September, 2014 edition of The Litigator, for his article entitled "Ontario Disability Support Plan, Ontario Words and Other Systems", which includes a discussion on structured settlements, claw backs for clients on social assistance and other welfare benefits, and other considerations when entering into settlement discussions. Michael was also the co-author (together with Susan Vella) of "Defence Strategies in Sexual Assault Claims: What Was Old is New Again", published in the September, 2015 edition of The Litigator. Michael maintains a Legal Practice and Procedure blog, designed to help young, new, and even more experienced, lawyers navigate through the complex practice and procedure encountered in civil litigation. Prior to joining Rochon Genova, Michael practiced at an international law firm in New York primarily in the areas of corporate finance, securities and commercial law, working with clients on initial public offerings, financial filings, mergers and acquisitions and strategic global investment/expansion strategies. 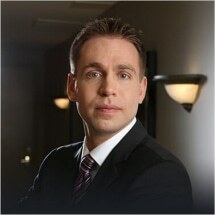 Michael subsequently worked at a boutique law firm in Toronto in the areas of construction law, employment law, and commercial litigation, where he represented clients at the Ontario Superior Court of Justice and the Ontario Court of Appeal, as well as at various tribunals, including the Ontario Human Rights Tribunal, the Real Estate Council of Ontario and the License Appeal Tribunal. Michael has applied his corporate, securities and commercial experience towards some of the firm's major cases in securities litigation, providing ongoing assistance and support throughout the process. By applying his unique perspective and broad range of experience, Michael is able to provide a unique paradigm through which to approach and manage these types of cases. Michael obtained his Honours Bachelor of Arts in Psychology from the University of Western Ontario in 2005 and his LL.B. from Osgoode Hall Law School in 2008. While attending law school, Michael worked as a division leader for the Community & Legal Aid Services Programme in the Youth & Education and Employment Law divisions where he represented clients at the Ontario Human Rights Tribunal, the Toronto Small Claims Court, and the Ontario criminal courts. Michael was called to the New York State Bar in March of 2009 and to the Ontario Bar in February of 2010. Michael has always placed a strong emphasis on volunteering in the community in various capacities. Since his call to the bar, Michael has applied his legal skills and training by volunteering as duty counsel at the Toronto Small Claims Court, as a coach and judge for student mock trial competitions, and as a lawyer for the Law Society's free Lawyer Referral Service. Michael currently volunteers with the Independent Legal Advice Pilot Program for Survivors of Sexual Assault, providing legal advice to survivors of sexual assault to help them make informed decisions about their next steps. In his spare time, Michael plays a variety of sports. His favourites include basketball, biking and tennis. Michael also enjoys travelling and learning about other cultures and he tries to take advantage of these opportunities whenever they arise.